EPR was present this week in Vienna, Austria, as co-organiser of the ‘Employment for All – Strategies for Implementing the UNCRPD‘ conference held on the framework of the Austrian Presidency of the Council of the European Union. 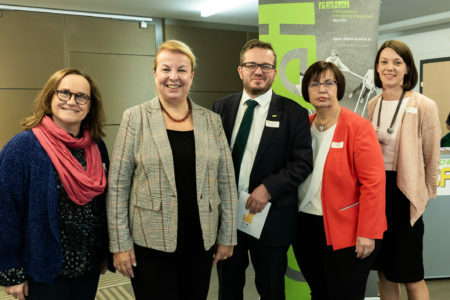 Together with other European organisations such as EASPD, Dabei Austria (the Austrian Umbrella Organisation for Vocational Integration) and with the support of the Austrian Ministry of Social Affairs and the European Union of Supported Employment the conference attracted 250 participants to discuss a better implementation of Art. 27 of the UNCRPD, on work and employment of people with disabilities. Our Vice-President, Sabina Lobato Lobato, and our Secretary General, Laura Jones, took an active part in the debates and discussions during the two-day conference and had the opportunity to discuss with other partners and the Minister on ways to improve the employment of people with disabilities.